Lorry (Grable) is a popular pin up girl at the local USO canteen during World War II. She has a bad habit of stretching the truth including saying she’s engaged to every serviceman she gives a photo to. Her latest lie is that she and her friend Kay (Kent) are going to Washington, DC to join a USO show, when they are really going to work as military stenographers. En-route to DC, the girls stop over in New York and go to an exclusive night club. Another lie gets them seated at a table with war hero Tommy Dooley (Harvey), who thinks Lorry is a musical comedy star. 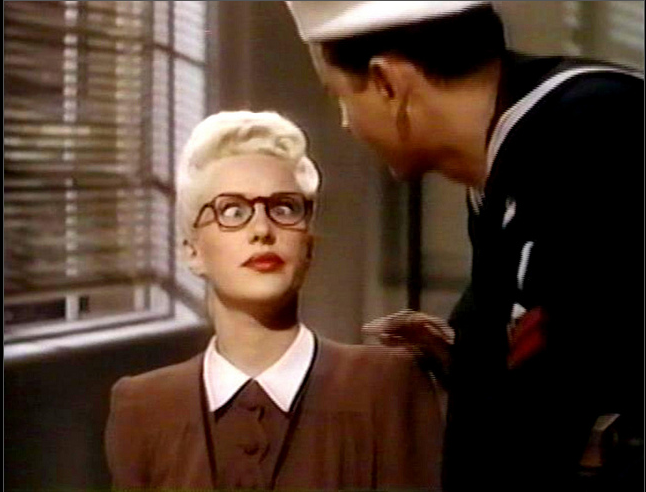 When Lorry runs into Tommy in DC, she disguises herself (using the Clark Kent approach by just putting on a pair of glasses) so he doesn’t know it’s her. -Betty Grable was pregnant during the making of this film. While her waist line is slightly larger than you are used to seeing, she is still quite small. You can tell the most when there is a side shot of her marching at the end of the “The Story of the Very Merry Widow” musical number. -During the military drill at the end of “The Story of the Very Merry Widow,” the real Women’s Auxiliary Corp (WAC) drill team was used, rather than actresses. -Linda Darnell and Don Ameche were originally set to star in the movie. -The film is based on the famous 1941 pin-up photo of Betty Grable taken by Frank Powolny, according to “Twentieth Century Fox: “The Zanuck-Skouras Years, 1935-1965” by Peter Lev. Lorry’s disguise- dull colored clothing and glasses. -The Skating Vanities is a roller skating sequence after the “Red Robins, Bobwhites and Blue Birds” number. It’s like a Sonja Henie ice skating number….but with roller skates. It’s almost less impressive because roller skating is more common place than ice skating. -Joe E. Brown and Eugene Pallette may be the best part of the film. -Though rather long, Betty Grable’s drill sequence with WAC’s is pretty interesting. 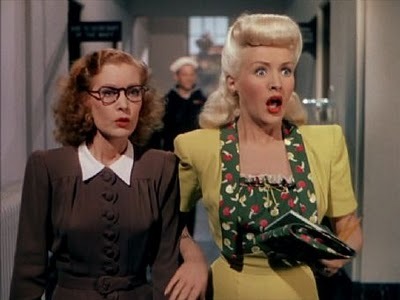 “Pin Up Girl” is colorful, World War II themed and has great music, but it isn’t Betty Grable’s best film. The plot is crazy and her constant lies can be a bit frustrating. This is also probably stupid, but I hate when Twentieth Century Fox changed Betty Grable’s honey blond hair and made it bleached blond. This bothers me more than it should in this film. This movie also ends with what I call “the smile resolution.” A couple has a misunderstanding. One of the parties is informed by a secondary character of the truth. The film ends with the misunderstood party performing on stage, the informed lead sitting in the audience and the couple grin at each other–letting the viewers know everything is alright. I can list several movies off of the top of my head that practice this, and it leaves me feeling unfulfilled. Though Betty Grable is the star of this film, I think Joe E. Brown and Eugene Pallette steal the show with their minor roles. 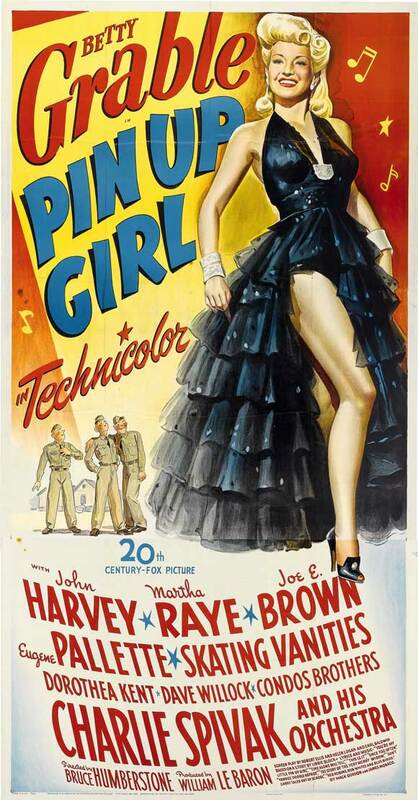 The plot is pretty silly, but then it was written to capitalize on her famous 1941 pin-up photo. Wonky plot aside, the real reason I like this movie is I love the music. There isn’t a song I don’t adore in this film. “Don’t Carry Tales Out of School” is my favorite. This entry was posted in Musical Monday and tagged Betty Grable, Musical Monday, Pin-Up Girl, World War II movies by Jnpickens. Bookmark the permalink.